This Lavender Fudge is a smooth, creamy fudge with a melt-in-your-mouth texture and a lovely lavender flavor! I haven't always been a fan of floral desserts, but when they are done right, they are delicious. If you're not sure whether you're a lavender fan, give this recipe a try and see what you think! Enjoy this fudge plain, or give it a drizzle of chocolate and a cute candy topping. Prepare a 9x9-inch pan by lining it with aluminum foil and spraying the foil with nonstick cooking spray. Combine the cream and lavender in a small saucepan over medium heat. Bring the cream to a simmer, then remove the pan from the heat and cover it with a lid. Allow the cream to sit for 20 minutes to infuse it with lavender flavor. After 20 minutes, pour the cream through a fine-mesh strainer into a medium saucepan to remove the lavender. Add the butter, sugar, and salt to the cream, and place the pan over medium heat. Stir until the sugar and butter melts. Continue to cook the fudge, stirring frequently, until it comes to a boil. Insert a candy thermometer and cook the fudge, stirring frequently, until it reads 235 F (113 C) on the candy thermometer. Once it reaches 235 F, remove the pan from the heat and add the white chocolate chips and the marshmallow cream. Stir vigorously until they melt into the fudge. If necessary, return the fudge to the heat for brief periods to melt the chips. Add the vanilla extract, and 3 drops of purple food coloring. Stir well, and if necessary, add another drop or two of coloring to get a shade of purple that you like. Pour the fudge into the prepared pan and smooth it into an even layer. Allow it to set at room temperature for 3 to 4 hours, or in the refrigerator for 1 to 2 hours. Once set, cut it into small 1-inch pieces. To make the optional chocolate drizzle, melt the chocolate in the microwave in 30-second increments. Transfer it to a plastic bag and cut a small hole in the corner. Drizzle a swirl of chocolate over each piece of fudge, and then refrigerate the fudge to set the chocolate completely. 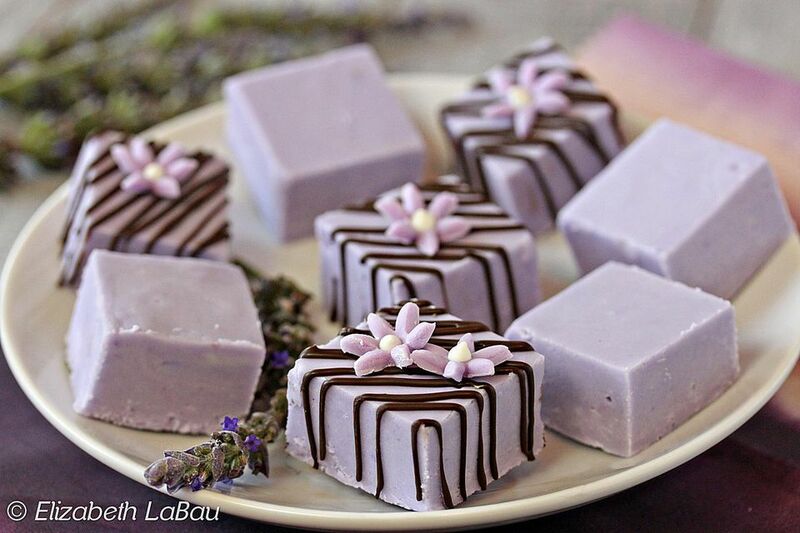 Store Lavender Fudge in an airtight container at room temperature for up to one week or in the refrigerator for up to two weeks.